Stevie Nicks has gone solo for the 24 Karat Gold tour playing more than two dozen arena dates in North America before the end of the year. Production designer Paul Guthrie of Toss Film & Design in Minneapolis chose 88 ClayPaky Mythos fixtures for the lighting rig. He previously deployed Mythos on tours for Miranda Lambert and Macklemore. 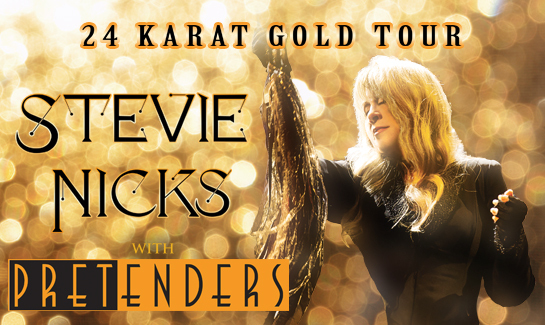 Nicks’ latest tour, in support of her album, 24 Karat Gold – Songs from the Vault, launched in Phoenix and will wrap in Los Angeles. While the iconic singer/songwriter appears as a solo artist, she tapped the Pretenders to open for her – delivering a powerhouse show for ticket holders. 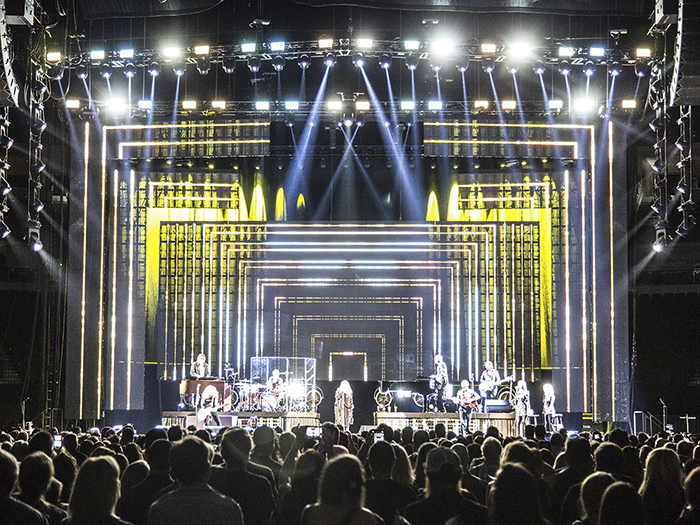 A veteran of Nicks’ tours, Guthrie endeavoured to: “create something new and a bit more modern” for her new show. “Stevie enjoys using video content so the tour features a lot of video on an LED videowall backdrop and L-shaped scenic pieces,” he explained. “Our overwhelming lighting edict is always no smoke. So we defer to lighting the band and adding in layers of light to create new looks.” The versatility of Mythos offers myriad options to Guthrie. “It’s fun to have one light that can produce a multitude of different effects in the same head,” he said. “Mythos is basically the workhorse light in the rig.” He notes that the tour’s complement of 100-120 moving lights is now considered a medium- size rig for an arena tour adding: “It used to be that 16 were considered to be a lot! We’ve come a long way.” PRG’s Las Vegas office supplied the fixtures. Eighty Mythos are mounted in the overhead lighting trusses where they form solid lines of fixtures. Guthrie reported: “On the downstage and mid-stage trusses they provide stage wash and beam effects. Those on the most upstage of the trusses, upstage of the videowall, create layers to add depth.” Eight more Mythos are positioned on the floor upstage of the band to illuminate their dynamic performance.